One thing gardeners love to do is to visit other gardens. It is a chance to see how others create beautiful spaces and inspire the rest of us to tweak or refine our own gardens. Inspiration and fellowship all in one package – what a great idea! This summer, I will be joining dozens of other garden bloggers from across the U.S., Canada, and the UK to visit gardens in the Washington D.C. area. Garden Bloggers Fling is an annual gathering of garden bloggers to visit beautiful gardens and make connections with like-minded folks, an event I’ve been wanting to attend for the past few years. Tammy, one of the organizers of this year’s fling describes it as “three and a half days of gardeners gabfest.” Gentle encouragement posted by fellow blogger Jason at Garden in a City tipped the balance for me, as well as an image from a gorgeous rose-filled Franciscan monastery garden on the tour. There is nothing better than visiting gardens to discover new ideas and gain new inspiration. Knowing first hand what a challenge it is to prepare your garden for visitors, I am always grateful to those who open their gates to us. Here are two gardens in Pittsburgh that are worth visiting. Choderwood is a hidden treasure in the eastern part of the city, located next to an industrial site and hidden behind a long stretch of high fence. A bold gate marks the entrance to the B&B sited above the Allegheny river. Ornamental gardens, quirky structures, scenic river views and a charming kitchen garden complete with chickens combine into one of the most unique gardens I’ve ever visited. A popular place for weddings, B&B guests can also stay in small boats on the river in season. How cool is that? Want a shot of color in the middle of of a long gray winter? Get your color fix in this urban landmark destination for garden visitors worldwide. Randyland is the brainchild of artist Randy Gilson, who bought a crumbling home in the North Side of Pittsburgh years ago. On a shoestring budget, he transformed his house and garden with paint brush and plants and went on to help establish neighborhood community gardens that have changed lives. Dreaming of the garden season is in full swing here – I’m starting seeds this weekend and my wish list for new plants is growing longer by the day. Are you planning any garden visits this year? In music, this symbol, a fermata over a rest, indicates the “grand pause” – a break in the forward motion of music. The beginning of this semester has created an unexpected backlog of work, so I am inserting a “grand pause” in my blog for a brief pause. Once I have “caught my breath” in that quiet time, I will return with some new music and images to share. In the hiatus, I offer links to a few favorite posts from when I first began this blog, a reprise of past reflections on music and gardening. Autumn Minimalism: the Constancy of Change has a video of life and movement in my garden set to orchestral music that I composed a few years ago (Sketches of America). Anatomy of a Thunderstorm is a first person experience of recording the sound of a thunderstorm. This is close to my heart, as I continue working on a piece, August in Penn’s Woods, in which recordings of the sounds of nature lie at the core of the music. An edited soundtrack of the thunderstorm recorded that day is included in this post, a recording that will become part of the new piece in progress. May rain come to all who need it. It is late August, the days are filled with the steady murmur of cicadas and the nights resound with the addition of a wood frog chorus that surrounds on all sides. This is my favorite time of year. The garden is lush and filled with late summer blooms of gold and purple and demands little from the gardener. Butterflies and hummingbirds flit around like living jewels, feeding on pollen that will speed their journey south in a few weeks. Storm clouds come and go, creating shifting patterns of light and shadow. The county park nearby celebrates the season with stands of goldenrod and Joe Pye weed. One year ago today, I began the Composer in the Garden blog and I want to thank everyone who has visited, liked, commented and followed. I have learned so much and have made so many friends. This community has offered me a place to explore ideas and commit to creating and presenting my music and images on a regular basis. This week, I am in the middle of composing a new piece, “August in Penns Woods” which will use a recording of the sound of my garden as both inspiration and as part of the piece itself. The year has come full circle. Here is my first ever post, The Sound of the August Garden, that contains the sound file that will serve as the basis for this new piece. Thank you, my friends, and I look forward to another year. Until I researched the meaning of “inspiration” I had no idea that it came from the Latin word inspirare – to breathe, to blow into or to breathe in. From a physiological point of view, breathing consists of two phases, inspiration (breathing in) and expiration (breathing out.) One current meaning of inspiration is the “arousal of the mind, feelings, etc. to special or unusual activity or creativity.” (Collins English Dictionary) A deeper look at this familiar word has a special and unexpected meaning to me, as I released a new composition a few months ago called “Breath” and have written about it in Breathe Out, Breathe In. And so, I was deeply touched by Margie in Italy’s nomination of my blog for “The Very Inspiring Blogger” award. Nothing could please me more than to think that what I post may inspire others, for I have also been deeply inspired by many blogs as well. I now have an opportunity to acknowledge and thank those bloggers who have touched my life and my view of the world. I must admit that for many years, I thought the blogging world was solely populated by the espousal of extreme opinions, whether political, social, or the merely petty. While this certainly exists, what I have really found in the year that I have been blogging is a large diverse community of people who generously share their insights, their reflections and perceptions, their sense of humor, and their creative vision with others. I never could have imagined such a place, with friends the world over respecting and encouraging each other and each with a unique gift to share. It continues to fascinate and inspire me. 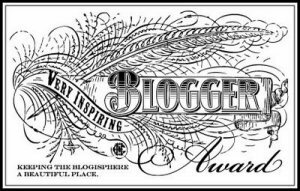 The Very Inspiring Blogger Award asks me to thank my awarder, reveal seven facts about myself, and nominate seven others for the award. As you might guess, Margie has a deep abiding love for Italy along with family ties there and shares wonderful photos, stories, recipes, and ideas from her travels through that beautiful country. It is a wonderful blog for a personal take on Italy! I also have a deep love for Italy – the land of sunset colored buildings, deep green trees, a profound cultural love of music and art, and some of the best coffee, wine, and food on the planet. I spent two summers there while in college and have visited several times since. In addition to Margie’s blog, I follow Bagni di Lucca for my weekly Italy fix. 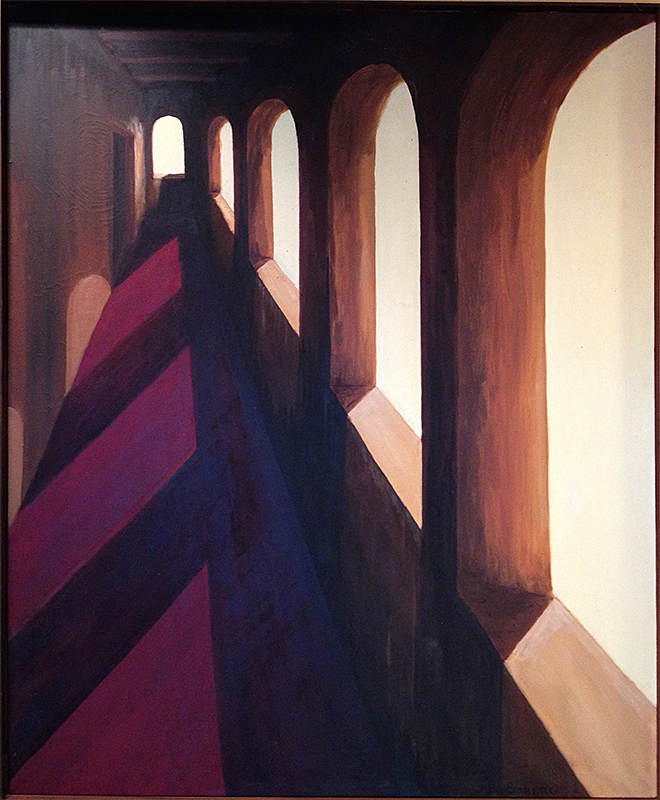 Here’s a painting I made that was inspired by the house where I stayed in Barga many years ago. I drink hot coffee year round, even during the “dog days” of summer. 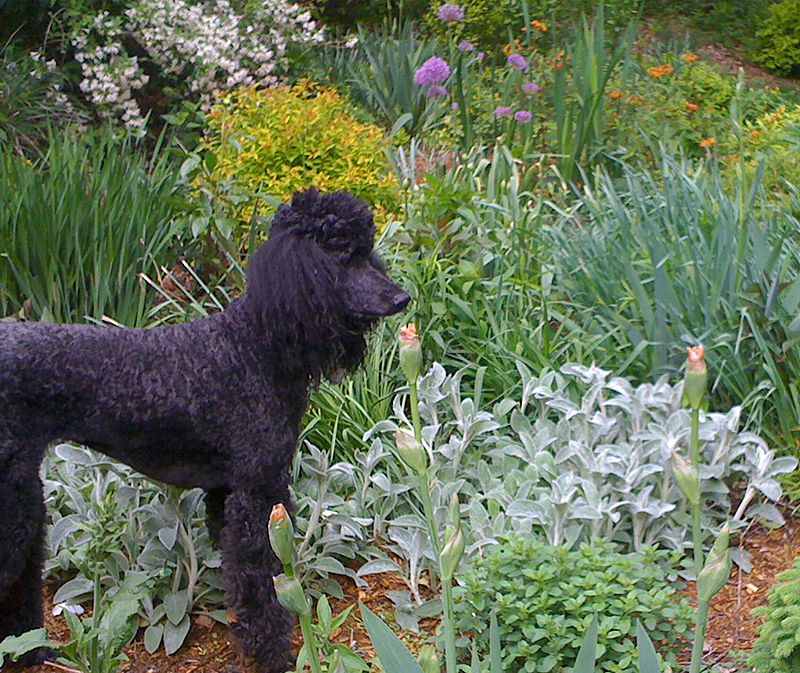 Speaking of dog days, my standard poodle, Angel Eyes, picked me. I went to the breeder intending to bring home her brother, but she danced around my chair until I fell in love with her on the spot. Good choice! I love to dance, even when I’m cooking. I miss the magic of the darkroom. I love Photoshop but there was something special about swirling the paper in the tray and seeing an image emerge. 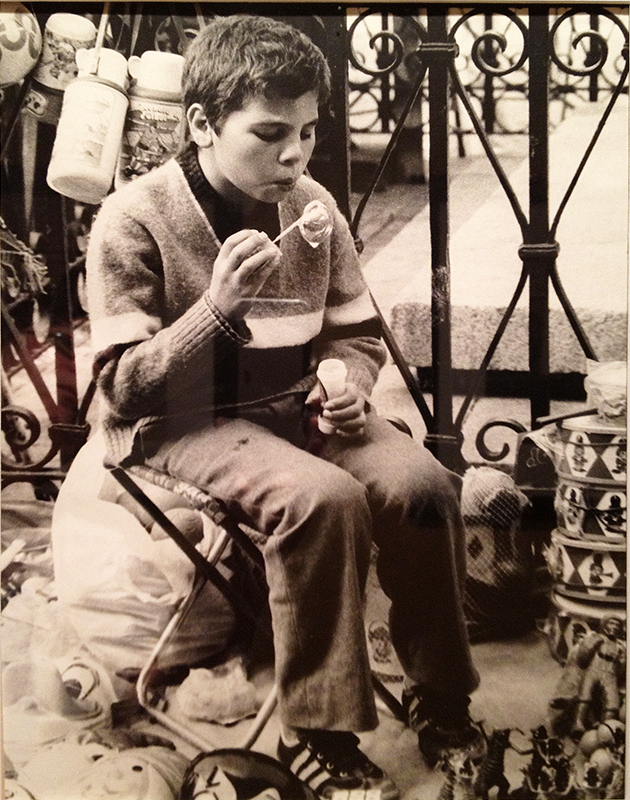 Here’s a B&W photo I took in Spain which was featured in some photography shows and a few newspaper reviews. I’ve seen the movie “Avatar” four times, twice in iMax 3D. In an alternative universe, I would live in that glowing garden. Catherine of The Daily Round writes one of the most thoughtful blogs I’ve ever read. She reflects on life’s big questions as well as its little details and often includes photos of her garden and her four legged friends. I am always deeply touched and inspired by her wisdom and her reflective approach to life. Tracy of Seasons Flow consistently amazes me with her deep knowledge of birds and wildflowers, which she shares through words and photos taken on her long walks through the Ohio countryside. It is always a fascinating journey to walk along with Tracy. Ogee of Gardens for Goldens has a unique site dedicated to the rescue of golden retriever dogs and a garden dedicated to them. Stories of happy endings and garden photos – what could be better? CheyAnne of New Mexico Mountain Girl is a gifted painter and photographer who shares her beautiful world in colorful images of horses, birds, and even old rusted pickup trucks in the New Mexico landscape. I’ve been following CheyAnne since I began blogging and even dream about her beautiful images sometimes. In another week or so, I have another award to acknowledge, so I will save a few nominees for that post. Want to read more about inspiration? Visit Wikipedia on “Inspiration” with many interesting links. One more award! Jean of Cycle Write Blog generously nominated me a while back for the Versatile Blogger award. Jean has a wonderful blog about her cycling adventures around the city of Vancouver, often featuring fascinating neighborhood stores, eateries, art in the parks, and architectural standouts. If you’re a gardener, you might especially enjoy her post “Nurturing Life: In Praise of Gardeners, Keepers of the Earth.” Since I already received this award a while back, I will direct you to my response post “On Being Versatile” for a peek at my answers and the other blogs I nominated for the award. When we were kids riding in the family car, my dad would always announce an upcoming rollover in the car mileage. Turning over to the next thousand miles was a big deal and we all leaned over the front seat to watch the numbers change from many 9’s to many 0’s, then gave a big cheer! I’ve been blogging for a little over ten months, once a week, with a rare mid-week post. This blog has helped me enormously in finding a voice and creating a welcome challenge to express myself and share my ideas, images, and music. Little did I anticipate how many wonderful people I would meet and learn from along the way. So, when I saw my 100th Follower (thank you, Historic Virginia Plantation) and my 10,000th View appear on the same day, and my 500th Like a few days earlier, it felt like a milestone reached and I gave a little cheer when the numbers rolled over. For many of you, I am sure these are small numbers (and it is probably very impolite to make them public!) but to me, they represent a valuable contact with others that I wouldn’t have had if I had never begun to blog. And so, I want to express my deep thanks to those who read and follow and visit and comment – you are never taken for granted! Blogging continues to be a pleasure rather than an obligation and I hope that it remains that way. Here’s a link to my very first post on August 28, 2011, The Sound of the August Garden. Enjoy! 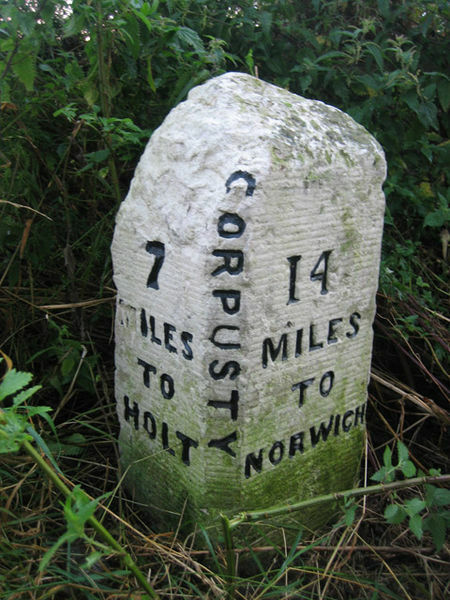 Thanks to Zorba the Greek for the use through Creative Commons of this great image of an ancient stone milestone in the UK.